Home » Injured in a Lyft Accident—What’s Next? Lyft is a popular ridesharing service that allows car owners to use them as taxis. Just like regular taxi cab operators, however, Lyft drivers get in their fair share of accidents. 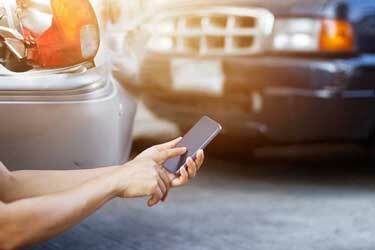 If you were injured as a passenger, or if a Lyft driver struck you, then you can probably receive compensation. But what steps should you take? Actually, your claim will depend on how the accident unfolded. Identify which situation described below best describes you and read on to see what steps you can take. Your Lyft driver might have been negligent or reckless by, for example, speeding or following another car too closely. In a crash, you can be injured as a passenger. Because the Lyft driver is to blame, you will need to make a claim with Lyft. Lyft insurance claims are like any other insurance claim. You should ask the Lyft driver for the name of their insurer. You will submit medical bills and other information to them. In Colorado, Lyft carries insurance with a $1 million policy, which should be sufficient to cover your losses. Another driver might have struck your Lyft, injuring you. In this case, the Lyft driver is not to blame; another motorist is. As a result, you will make a claim on the at-fault driver’s insurer. Colorado is a fault state, which means that the person responsible for a crash becomes responsible for paying compensation to victims. Remember to get the insurance information from the at-fault driver, as well as their name, address, and phone number. If a police officer comes out to the scene of the accident, get a copy of the police report or ask how you can get a copy. Because a private motorist is to blame for this Lyft accident, you are limited by that driver’s insurance policy. In Colorado, all drivers must carry at least $25,000 per person in liability insurance, up to $50,000 per accident. This is quite a bit less than the Lyft insurance policy. However, Lyft also carries a $1 million uninsured/underinsured motorist policy, which can kick in to cover losses in excess of the at-fault driver’s policy. You might not have been a Lyft passenger. Instead, you could be a motorist or pedestrian who gets struck by the Lyft driver. In these situations, you will submit a claim to Lyft’s insurance company so long as their driver was to blame for the accident. The Lyft driver has the app open and is looking for a match. Lyft’s insurance will cover $50,000 per person in bodily injury liability, up to $100,000 per accident. Lyft also has $25,000 in property damage available. The Lyft driver has been matched and is on the way to pick them up. Lyft has up to $1 million in liability coverage. The passenger is in the car. The $1 million policy applies. If you have been injured in a Lyft driver accident, or if you were a passenger struck by another motorist, you might be entitled to money compensation for your personal losses. To find out more about how to proceed, contact an experienced lawyer at Olson Law Firm. We offer a free consultation, which you can schedule today by contacting us.